BACK TO OUR BLOCKS…I have layed out a whole block out here…everything to me looks good…but you will not entirely know until you stitch it…but I have decided to scrap up the tans and butterscotches and keep the black backgrounds the same in each blocks…therefore I will not be stitching this together. But I redid all the math and I came up with the same measurement as the directions…And you know APQ has tested their directions. 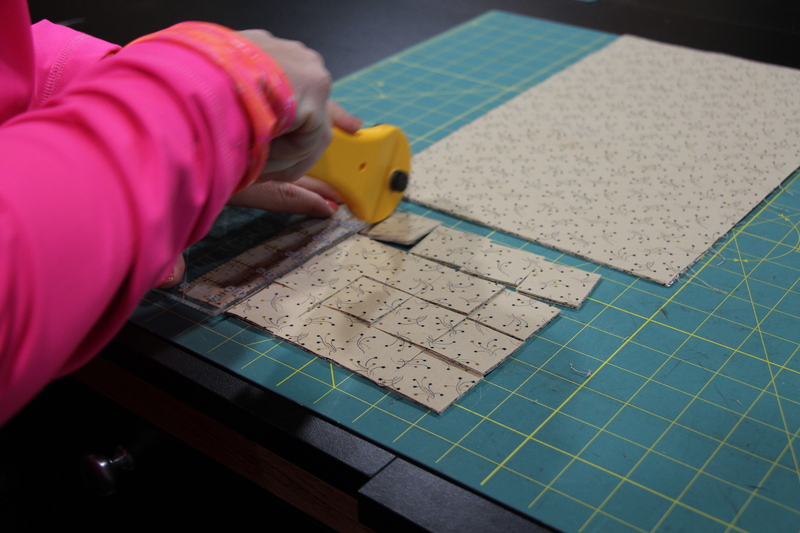 Now to MASS cut…I do not cut a strip…pick up my ruler move my cut fabric…lay down my ruler and continue this process. Layer fabrics and trim off the left edge. move to 1 1/2…and cut.. 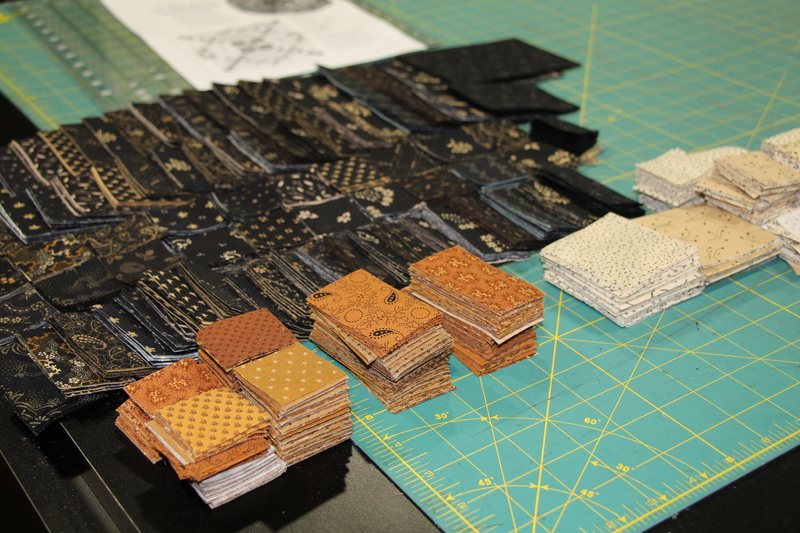 I now have 20 of the 21- 1 1/2″ squares..I will cut the last one with the 2 1/2″ squares. 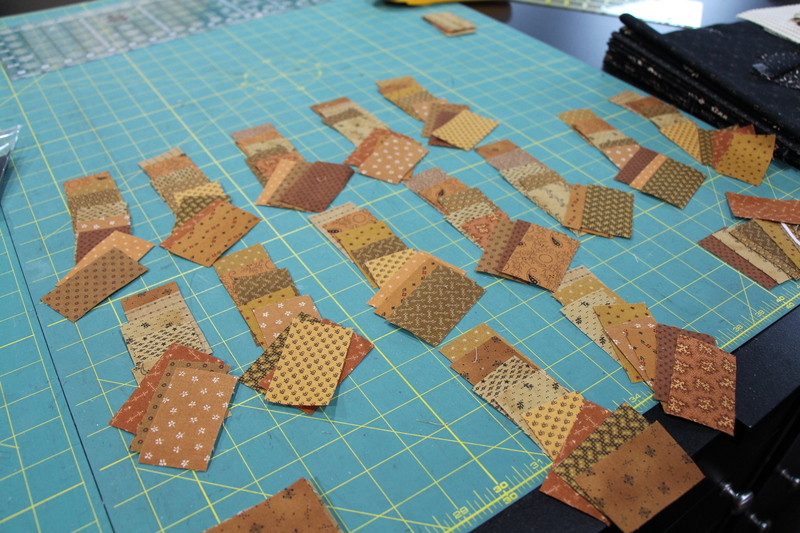 After everything is cut…I sort into blocks. 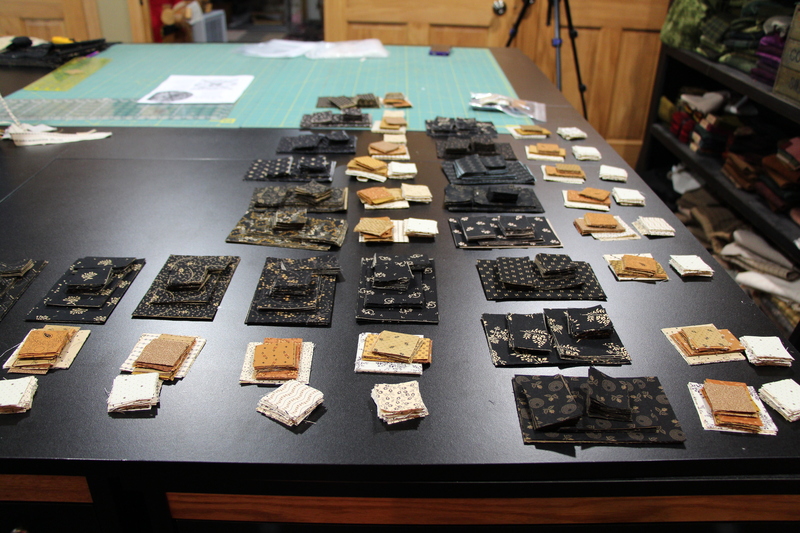 20 blocks…my backgrounds are the same for each block…so I will spread them out into piles of all of each cut of the same background together. This is how you get so much done! Organization is the key. Thanks for the visual! Wow! After all these years I knew there had to be a more efficient way. . . Awesome! I would love to take just one class with you. . . Thanks for all you show us. Good ideas and helpful visuals. I used to cut like that but found that sometimes the last cut resulted in a slightly smaller piece. So guess important to be sure you have your measuring line the same place (in the center) each time. And to be able to move around the piece you are cutting rather than having to move the pieces in order to do the second cuts. 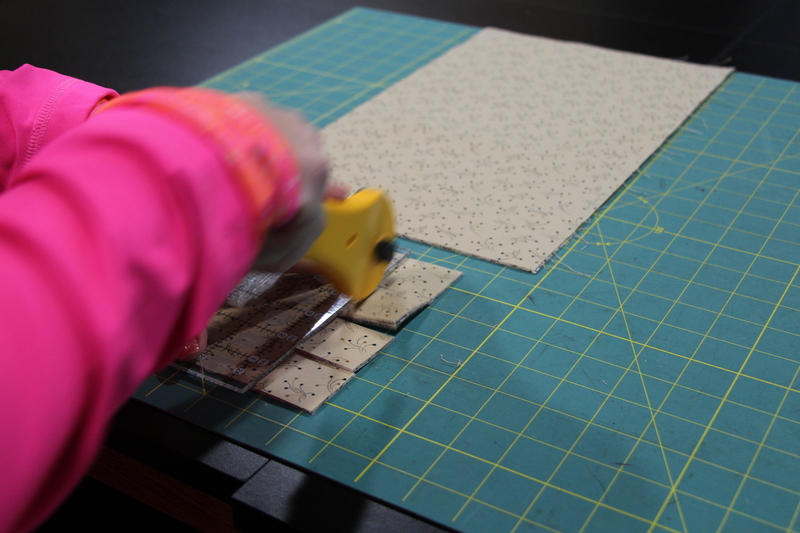 I can walk around three sides of my cutting table so an easy do for me. This is a great tutorial. This is the way (with just a few changes) I cut larger projects. 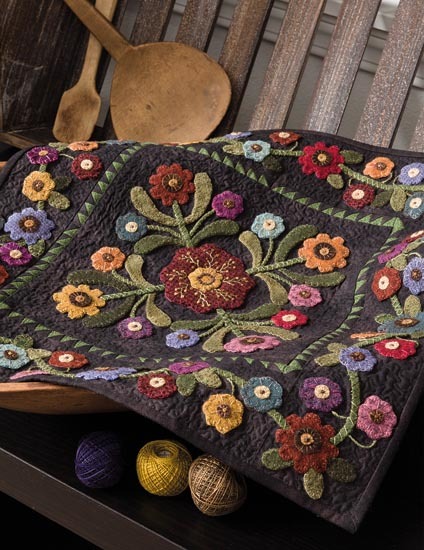 It is particularly good for this quilt along. 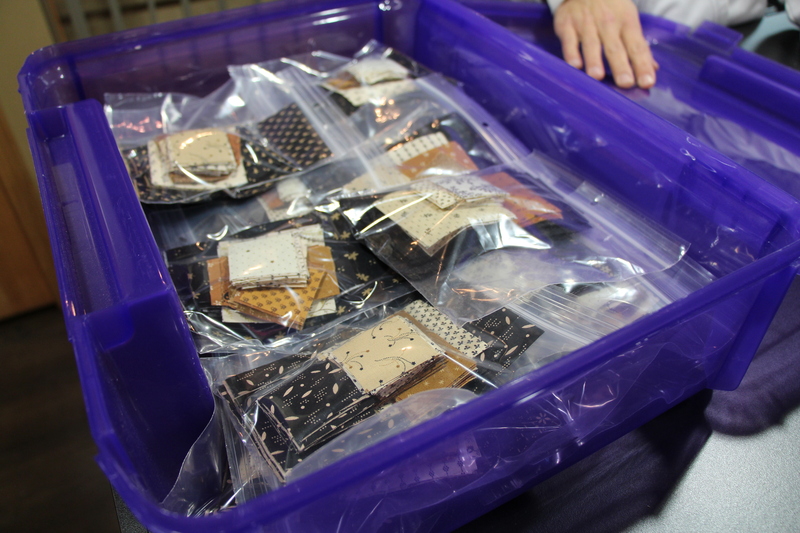 I’ve always been a fan of individual blocks in baggies. So, no matter how much I think I know, I always learn something new! These tutorials are always welcome! Thank you. 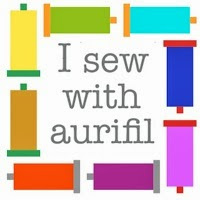 I love seeing organization tips with quilting, it’s what keeps me calm while sewing. 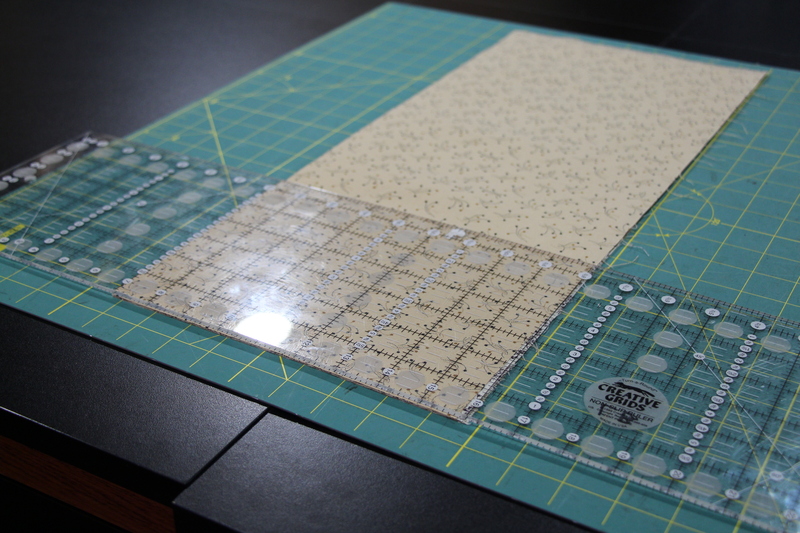 Using the grid on my cutting mat is something I am trying to do more. 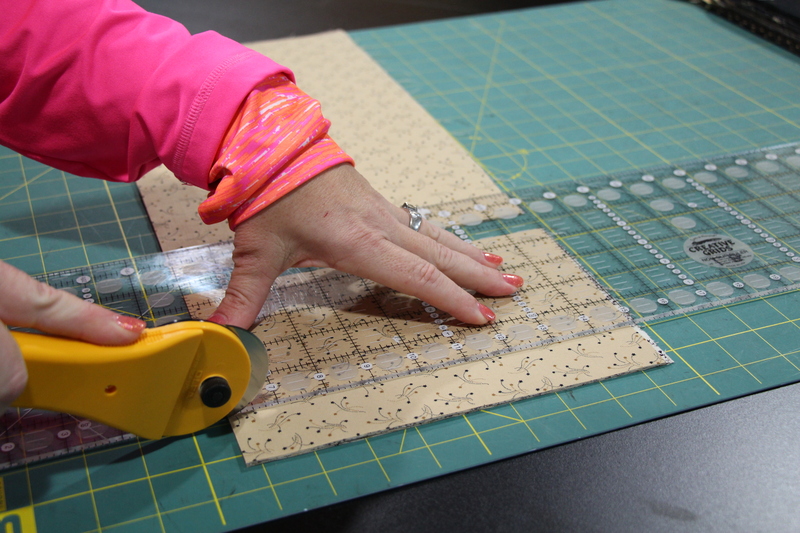 NO…please do not use the gird on your mat….use your ruler only!!!! Awesome visual! Great cutting and organization tips too! 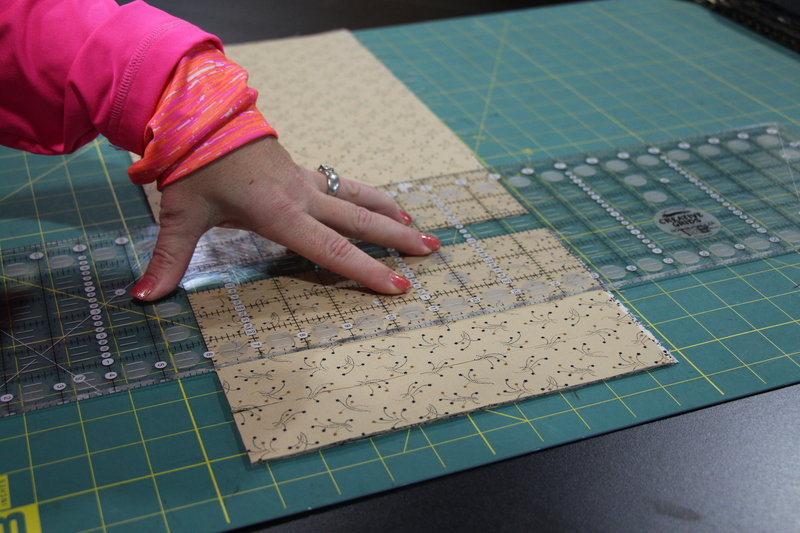 Interesting – that you sew together by the BLOCK and not by sections. I love that idea! And that pink/orange shirt is AWESOME! Thanks for the cutting tips! Hi Lisa! I appreciate you showing this cutting technique. 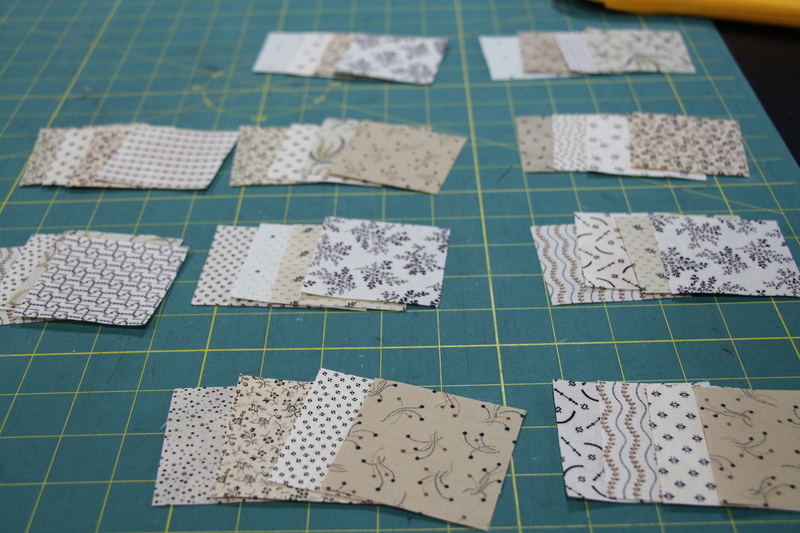 I’ve been cutting 1 1/2 strips for a project like this and then subcutting. Your method cuts the slicing down considerably. Also Ii think you have more control over the fabric by keeping it in a bigger square vs long skinny strips. Thanks so much! Lisa: Thanks for posting this. 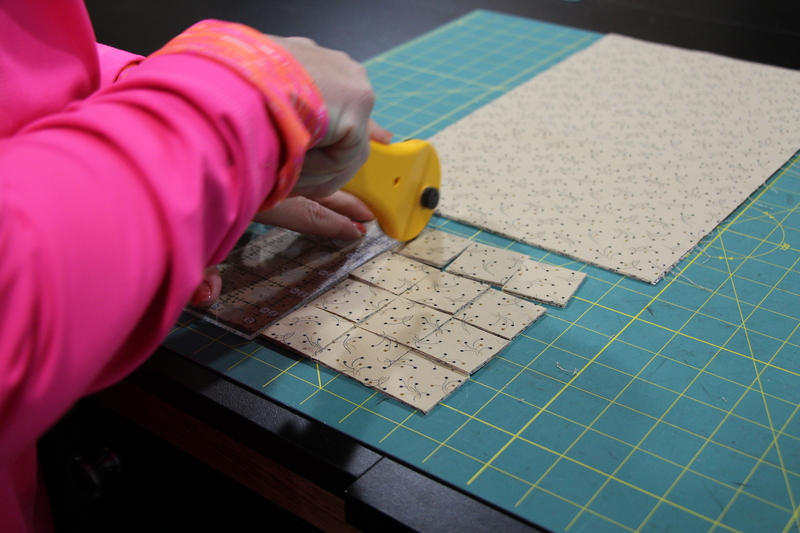 I took your class at Northwest Suburban Quilters Guild where you did a demo for this cutting method. I couldn’t remember exactly how you did it. Now I know! I’ve saved it. Thanks so much for making my cutting life easier. Carole T.
LOVE,LOVE,LOVE your cutting method. Thank you for sharing!!! It’s never a “bother” especially when your giving instruction !!! I’m beginning to understand how you get so much done! 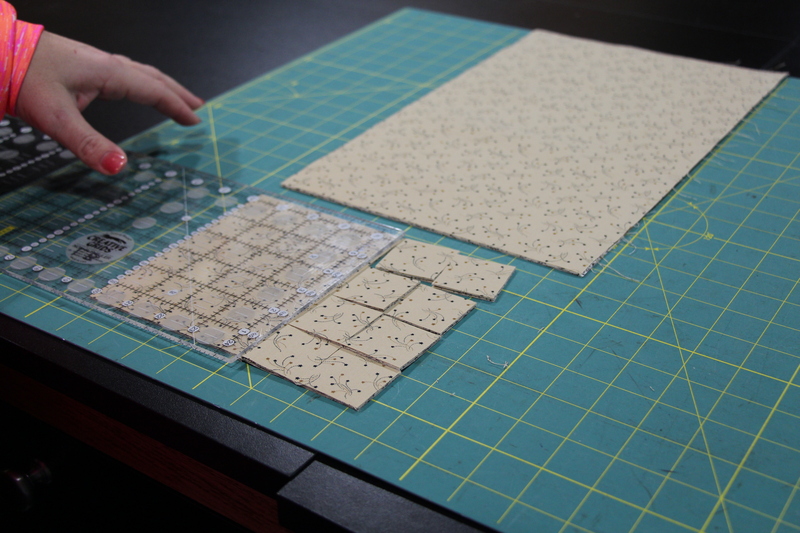 I love the idea of putting the pieces for each block in a baggie…..before you start sewing you know you’ve got the cutting done right. Thanks for sharing your method. 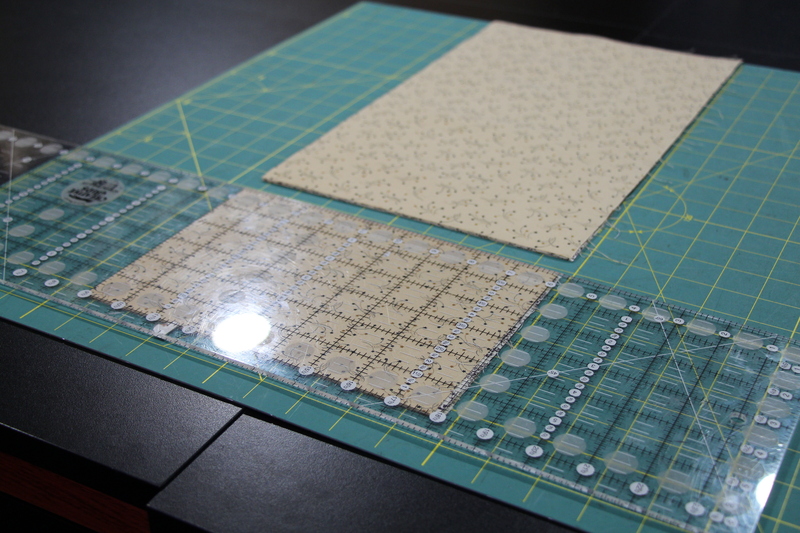 Thanks, question–if you don’t use the grid lines on the mat——how do you know that your ruler is perfectly straight? 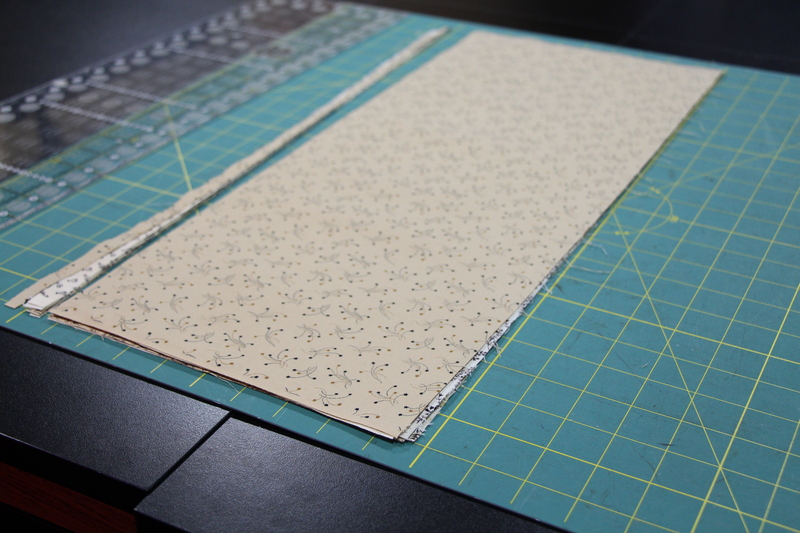 look at the second picture…I have cut the left side…then I line up a line of my ruler on this cut…then I proceed to cut the bottom off…making the fabric perfectly straight. 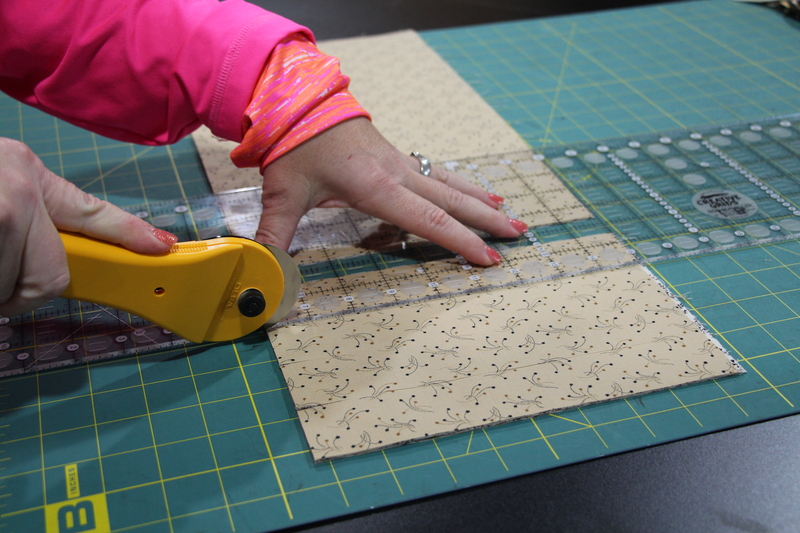 Try this…turn your mat over and cut without the lines…yes i use the lines on my mat as a guide when I am positioning my fabric on the mat…but never use the lines on the mat for measurement. Love this. I’ve always moved my ruler over the already cut stuff so this makes so much sense. You can do tutorials anytime. You get so much done, knew there had to be secrets to your methods! I think this will be an after Christmas project. I think it is one of the most fun things the magazine has proposed. Thanks for the helpful instructions. You never cease to amaze. 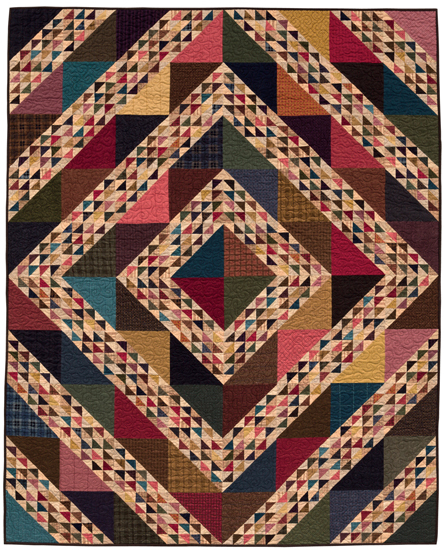 I love the colour choices and can’t wait to see the finished quilt. 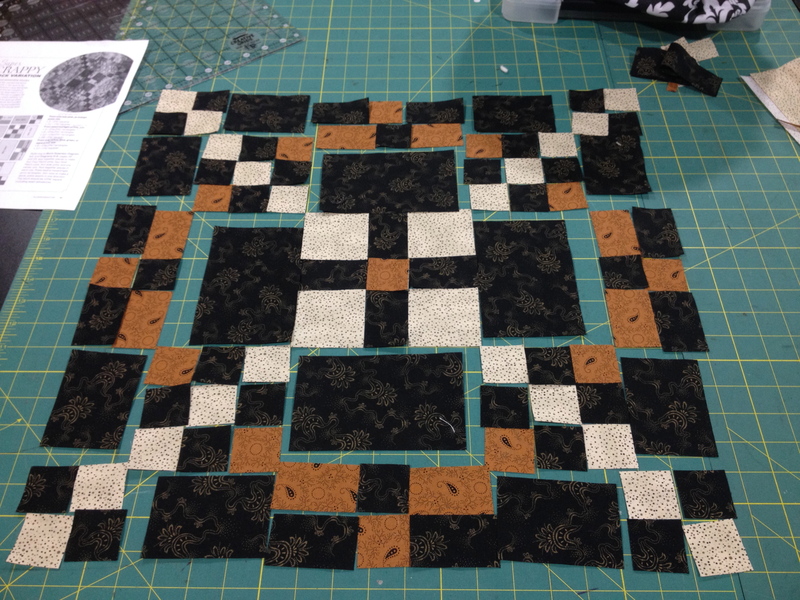 Thanks for sharing the process of making your quilt. Now, can you give us a tutorial for using thangles. I ordered your Summer Love little quilt and want to do it right. It looks like the thangles use a 1/8″ seam .Do you sew the pieces together with a 1/8″ seam too or 1/4″? Awesome. I would have never thought of this. Thank you so much! ok…we will do the thangles too…you would stitch them with a 1/4″ seam…. Thanks for the 2nd issue of the blog post. LOVE all the detail. I joined your 2 BOWs this last summer and thoroughly enjoyed them both. The cutting directions sheet you gave for the pieced one made it very easy to cut all the blocks- and now I see you must do that plan every time! Love it! I started cutting this way a while back and really like it! Thanks for writing about mistakes in patterns.. I try to not take it personally when people find mistakes but sometimes it is hard. I’m re-doing my website so it will have all the corrections! Thanks for your help! YOU ARE THE BEST!!!! THANK YOU!! THANK YOU!! Thank you for taking the time to share your methods! Not too wordy at all…just lots of great information and great detail! Would love to see more…especially how you work with wool. Thanks again! Thank You! I just love when you share your knowledge with us. We are so lucky. (I still refer to some of your Christmas posts from last year!). 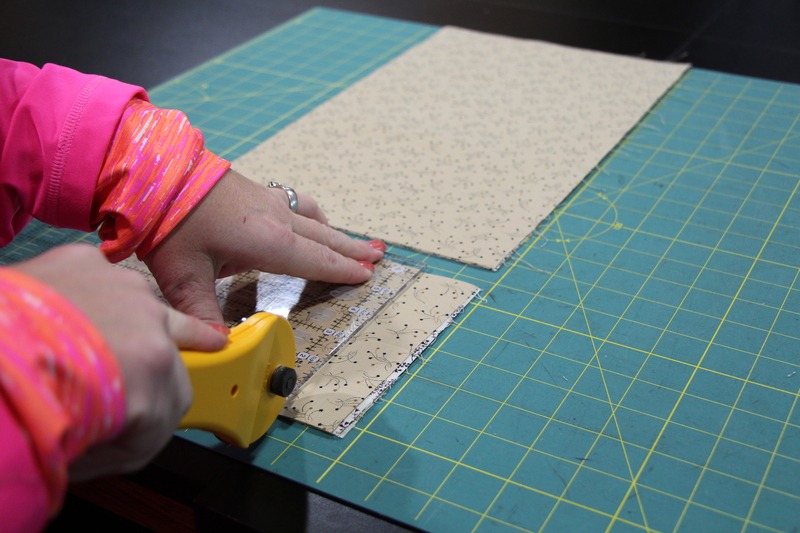 I too have always moved my ruler over the already cut fabric, so I will definitely be trying this. I was told a long time ago to never rotary cut with more than two or three layers, but I can see with your method that several layers are possible! Thank You again! Thanks for showing me how to cut these. I have done done it your way before. It would save me a lot of time and I would have less waste. I love the colors you chose. I don’t suppose you will be offering kits of this? Thank you for this great idea, I subscribe to the magazine and have it. 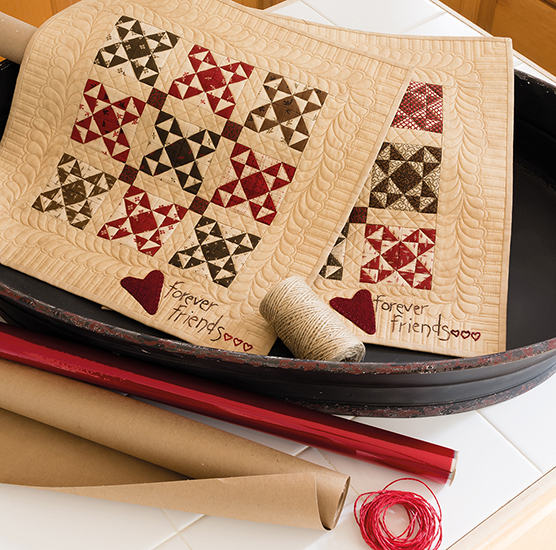 Going to make my quilt scrappy. By the love your products and patterns. Thank you and have a very Merry Christmas. 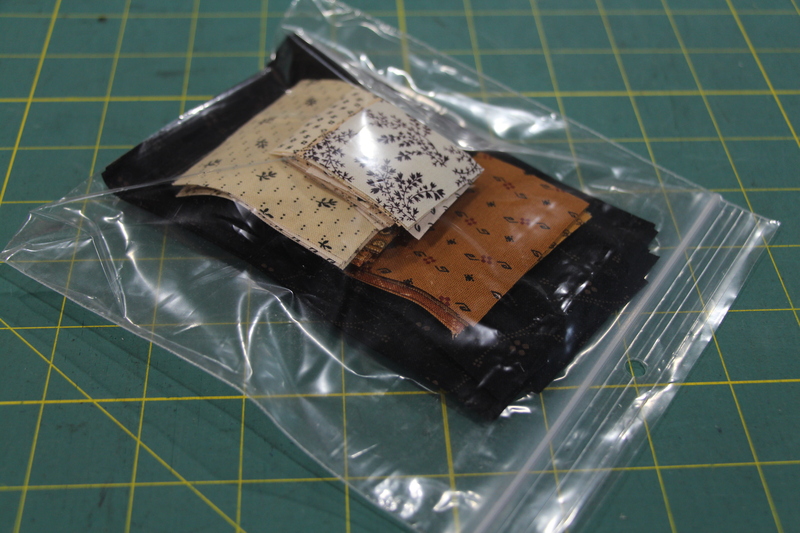 I love using ziplock bags for quilting and all kinds of organizing. This is a beautiful block and your instructions are very clear (always a plus.) However, why do you cut each individual piece and then collate them to the individual block. Why not strip piece? Wouldn’t that be easier for a block that contains such beautiful basic components like the 9-patch, 4-patch and variations? That’s understandable, but if the fabrics in that photo are your idea of “scrappy”, you need to look closer into the definition. All the fabrics from each “color” are the same fabrics. It COULD be strip pieced and not pointing that out to your readers does them a disservice.